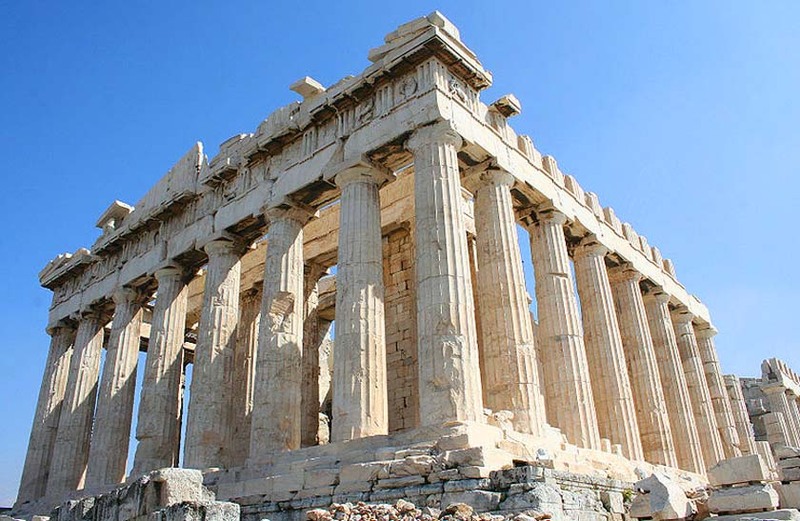 Ancient Greek architects Iktinos and Kallikrates collaborated with sculptor Phidias from 447 BC through 431 BC to design and build one of the most famous architectural masterpieces: The Parthenon (Athena’s Temple) at the Acropolis in Greece. Photo courtesy of CC Onkel Tuca. Architects. The word Architect means: “Chief Builder”, from the Greek “arkhitekton”, in which “arkhi” = chief, and “tekton” = builder. This was later converted into the Latin “architectus” and the obvious abbreviated modern version is architect. There are a number of university-level architects and architectural professors that feel that a more modern interpretation of the actual function of today’s architects is a blending of Art + Technology, which is a near blending of the word to = Architecture, as today’s architects, and indeed the last thousand years of architecture is a merging of artistic vision with the technology required to support that image durably. Also, the word could be interpreted to mean “technician of arches,” as the first portion of the word is “Arch”, then “tects”. As arches have been an historic and dependable means of spanning an opening, being the technician of arches works. Rand Soellner AIA/NCARB’s short definition of architects in society today would be: “A professional person who designs and creates documents and media used to construct handsome and functional homes, buildings, facilities, spaces and items.” Soellner uses the words “professional” to indicate that these people are trained and licensed, and the words “handsome and functional” to include these characteristics, without which, there would be no heart, soul or usability. Soellner mentions “homes, buildings, facilities, spaces and items,” as architects also design courtyards, monuments (take a look around Washington D.C.), orbiting space stations, landscaping, neighborhood street layouts, stage sets, ocean-going ships (naval architects), furniture and tableware, among other things. Frank Ghery just designed a line of jewelry! Soellner mentions “design” as that is one of the main activities of an architect, along with documenting those designs. (C)Copyright 2010 Rand Soellner, All Rights Reserved Worldwide. Anyone is allowed to link to this webpage from your own website, using the anchor text on your website of: Architects. Floor plan of the Parthenon, as designed by architects Iktinos & Kallikrates, 447BC. Architects have been around for a long time. Image courtesy of Wikipedia. particularly in the last couple of hundred years. Some believe this is good, some the reverse. There is a tremendous amount of liability involved with the construction of buildings and also with their design. If the architects have done a good job with their documents, the majority of the responsibility for the actual built product lies with the contractor. The architects provide a professional service. The construction contractor provides the actual built, physical product. There are further legal definitions of the word Architect and Architects. For instance, to be called the word Architect legally, you must be registered as an architect and licensed in at least one state in the United States, if you intend to be an architect in the USA. If you practice commercial design, you must be licensed in each state in which you provide services. Architects and quality of professionals. 1. The state board of architecture in each state jurisdiction. This is where architects obtain their licenses. 2. NCARB (National Council of Architectural Registration Boards). This is the entity that tests architects, maintains their records and facilitates reciprocity. 3. AIA (American Institute of Architects). The state licensing boards are where the rubber meets the road for architects. These are the legal, jurisdictional governmental organizations that can issue and otherwise administer an architectural license within their geographic territory. NCARB is the USA nationwide clearinghouse that administers tests and intern apprenticeship programs for would-be architects and for record-keeping of licensed architects, setting forth the requirements that architects must meet and creating and giving the exams each architect applicant must pass. All states in the USA have accepted the uniform administration of NCARB in order for there to be uniform standards of quality of all architects nationwide in the United States. NCARB also facilitates reciprocity throughout the USA for any architect certified by NCARB and in good standing. This means that if you are a practicing licensed architect in any state in the USA, NCARB can facilitate your licensure in just about any other state within the USA in a matter of a few weeks. The AIA is a professional club. It is each architect’s choice whether or not he wishes to be a member, subject to the AIA’s review and approval. The AIA has higher CEU (Continuing Education Units) required per year than most jurisdictions, so being a member of the AIA carries with it additional responsibilities for additional continuing education. This means that those that are AIA members may have more ongoing education than non-members, but this is not necessarily the case, as there is nothing stopping non-members in obtaining additional education in HSW (Health, Safety & Welfare of the public) subjects each year. The AIA has a political and public agenda to represent the best interests of the built environment for society and for the architectural profession. Being a member of the AIA gives credibility to members, due to its higher standards and nationally recognized professional image. Architects : Commercial Architects and Home Architects. There are mainly two type of architects: commercial and residential. Within the commercial arena, there are a multitude of specialties: office buildings, schools, shopping facilities, airports, industrial, governmental, and other technical specializations. Residential concerns housing, which can be multi-family or single family residences, and single story, low-rise, mid-rise or high-rise. Most professionals would likely group multi-family and anything over 2 to 3 stories in the commercial category, however, mainly due to the construction technologies involved. Many Home Architects fall into a residential category that is typically a single family home of wood stud or concrete block load-bearing wall construction of 1 to 2 stories, with or without a basement. 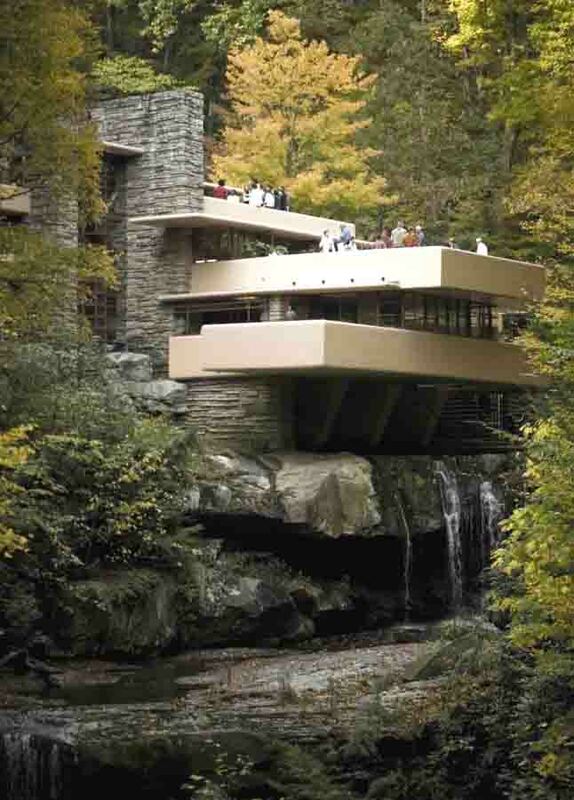 Falling Water by 20th Century famed architect Frank Lloyd Wright. Architects everywhere dream of a home design project like this. There are other people and companies that design homes that are Not architects and whom may have no architectural education, training or architectural licensure anywhere. They may have no licenses in any jurisdiction and no requirements for anything that they do. Beware. Although this practice is typically permitted in most of the USA, homes are some of the most technically complex facilities in the world, when viewed on a complexity scale on a square foot basis. So much so, that the AIA has suggested some of its highest suggested fee rates for the design and documentation of home architecture, due to this specialization’s complexity and high level of detail. It makes sense to have some of the most highly trained and experienced Real architects designing your home, where you live and sleep, eat and raise your children and love your family. Entrusting this sacred design responsibility to a non-architect is like obtaining the services of an ambulance driver to perform your life-saving surgery instead of the best medical doctor and surgeon you can find, that specializes in your type of need. The best advice: hire architects to design your home and other facilities.